5 Signs You Should Replace Your Electrical Panel | Hi-Lite Electric Inc.
11 January, 2018 Hi-Lite Electric Inc.
An electrical service panel is where the main power line from the national grid enters your home and is distributed throughout your electrical system to the lights, plugs, and appliances. The electrical panel contains circuit breakers whose role is to disconnect circuits in the event of power surges to keep the excess electricity from burning your gadgets and appliances. So if you have an old, faulty, or malfunctioning service panel, that does not fulfil its functions properly, you are at risk of burning electronics in your home, suffering a blackout, electrocution, or even electrical fires. When the service panel starts to wear down, it becomes increasingly susceptible to power surges. As a result, you may experience regular episodes of disconnected circuits. Another reason why the circuit breakers may be tripping is because your home’s electrical needs extend beyond the current capacity of the panel. If you suddenly find yourself resetting the breakers several times a week when you rarely needed to reset them before, then this could be a good time to schedule a home electrical safety check and get the panel repaired or replaced. Ideally, resetting a circuit breaker that has tripped should solve the problem. But if the breaker doesn’t reset long enough to resume your activities, or if resetting it fails to restore power to the application, then you could be dealing with a faulty electrical panel. You should have it inspected as soon as possible by a professional residential electrician and proper remedial action taken before the problem escalates. All things wear down, including the wires inside your electrical panel. These exposed wires quickly burn out, so you won’t notice unless you are around the panel. However, the signs should be evident, including a distinct odour coming from the panel, and some charring or burn marks around the circuit breakers. If you notice these signs of small electrical fires in the service panel, you may be in need of emergency electrical service. 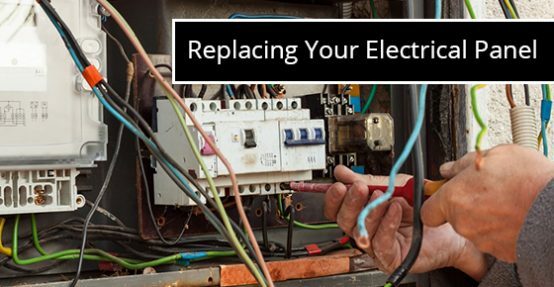 If you live in old house whose electrical system has not been upgraded and still uses a fuse box instead of a modern electrical panel with multiple circuit breakers, you should replace it as soon as possible. A circuit is comprised of multiple outlets connected to a single wire that is operated by one fuse or circuit breaker. These devices improve electrical safety by tripping and disconnecting power transmission when the line connecting the electric panel and your appliances becomes overloaded and at risk of heating up and burning. The circuits in many older electrical systems don’t trip, even when overloaded, which poses a great risk to your home. If your energy needs exceed what is available, there will be cross interference like dimming lights when operating high-voltage appliances. Keep in mind that one of the key reasons for updating the electrical system is improving safety. Many old homes contain just a few circuits that are not adapted for the modern high energy needs. So updating your panel can solve this problem and increase the number of outlets and circuit breakers for better power management. If you haven’t updated your home’s electrical system in a long time, or if you detect any of these warning signs, you should contact a licensed residential electrician to inspect the service panel and service it accordingly. Ignoring these signs can result in serious and costly consequences that range from a burnt power outlet, melted electrical wiring, or damage to plugged-in devices to more serious risks like deadly electrocution and electrical fires. You should also be on the lookout for any unusual smells, sounds, or electrical malfunctions as they could also indicate looming electric panel problems. Call a licensed electrician to troubleshoot the problem as soon as possible. Neglecting your home’s electrical system can have devastating effects. Keep in mind that your service panel influences the amount of power available for distribution around your home. The size and number of breakers influences where that power is directed. Updating your control panel has no effect on the wiring, unless you want to increase the number of electric outlets to eliminate the need for adaptors and extension cords. It simply improves the system’s ability to distribute more power.